Angel’s Envy is a whiskey created by fathers and sons. When Wes Henderson convinced his father, Master Distiller Lincoln Henderson, to come out of retirement for one last chance at creating a masterpiece, they weren’t sure what the future had in store for them. When Wes’ sons Kyle and Andrew joined the company, three generations of Hendersons finally came together to form the heart of our small family business. Naturally, Father’s Day is very important to us. It’s a day to reflect back on how we got here and who has made it all possible. As our small family has grown, we’ve owed a great deal of our success to our Whiskey Guardians. 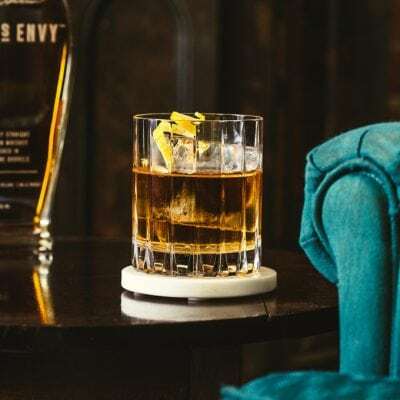 They’re local ambassadors, bartenders and whiskey fans that represent Angel’s Envy throughout the cities where they live and work, and they’ve been tireless advocates for our whiskeys since the beginning of the brand. In the spirit of Father’s Day, we’ve asked a few of them to consider their own families, and create a cocktail inspired by their father. Any dad would be proud of the results that they’ve stirred up. 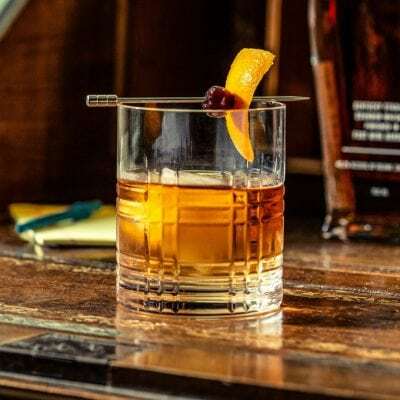 This particular cocktail was inspired by the idea of combining the flavors of a Manhattan and an Old Fashioned into a hybrid—because of my Dad’s preferences. The Old Fashioned is his favorite way to enjoy Angel’s Envy, but he still always asks me to ‘finish’ his drink with an extra cherry or two. Combine all ingredients in a yarai. Stir thoroughly, and strain over a large cube. Garnish with an orange peel and a brandied (or Bada Bing) cherry—or a couple of extra cherries, based on Dad’s preference. My Father’s Day cocktail was inspired by three generations of my family: my grandfather, my father and me. When my grandfather served in World War II, he and his fellow soldiers were part of the liberation of southern France. During their march through the region, American soldiers were often met by overjoyed Frenchmen who would pass them glasses of water for their long march. Sometimes, though, these celebratory souls would hand over glasses of calvados apple brandy instead, and soldiers would knock back an entire glass “not knowing” what they had been given. My cocktail is rinsed with the essence of this apple spirit to impart just a hint of my grandfather’s lasting influence. The Angel’s Envy is, of course, a product of a father and son collaboration, but so is the green apple shrub I use in this cocktail. My childhood home had an apple tree out front that I could climb as a kid, so I wanted to mingle the roots of my childhood with the city I chose as an adult. By combining the apple and the Louisiana sugarcane in my shrub, I intended to link the deep roots my father established for me back home to the city of New Orleans, where I reside today with great love. In a mixing glass, build fresh ice, Angel’s Envy, Tattersall Pommeau, green apple shrub, and bitters. Stir until well incorporated—approximately ten seconds or twenty rotations. Place approximately 1/4 part calvados into an empty double rocks glass and swirl to coat. Add fresh ice to calvados-lined glass and strain cocktail over fresh ice. Garnish with expressed lemon peel. My father isn’t a very big drinker. As a matter of fact, his first sip of alcohol that I’m aware of is when I got married. I named this cocktail “Without Faculty” because every time I would ask him why he doesn’t drink (I was just poking the bear, of course I knew the answer) he would respond by saying ” I don’t want to lose control of my faculties”. My friends and I still laugh to this day every time he gives us this answer. My Father loves, and I mean LOVES desserts, and one of his favorites is a Bananas Foster. Couple that with his undying love for all things ginger and I came up with this cocktail. All I have to do next is get him to try this drink and I know he’ll be hooked. Add all ingredients (except bitters) into a shaker tin. Add Ice and shake. 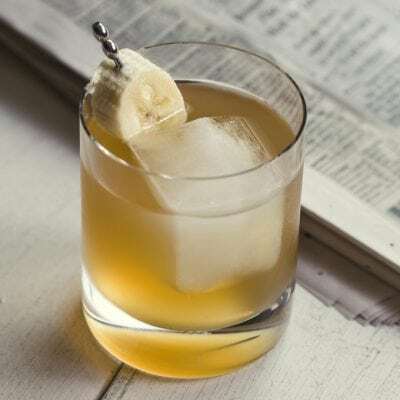 Double strain into a double rocks glass over one large ice cube and garnish with 3 drops of Tiki bitters and a banana slice. My father is a bit of a renaissance man. While we were living in the middle of nowhere Wisconsin, he did everything imaginable in the outdoors: he hunted, trapped, fished, farmed, and learned everything he could about nature. Then he passed on as much as he could to me and my two brothers. One really cool thing he taught us was how to tap maple trees and make fresh maple syrup and maple sugar. With this cocktail, I tried to pay tribute to all of the time we spent outdoors. It’s rich, smoky, sweet and could almost be a liquid S’mores—a drinkable version of what you’d make on a campfire. I think dad would approve. Stir all ingredients into a shaker tin. 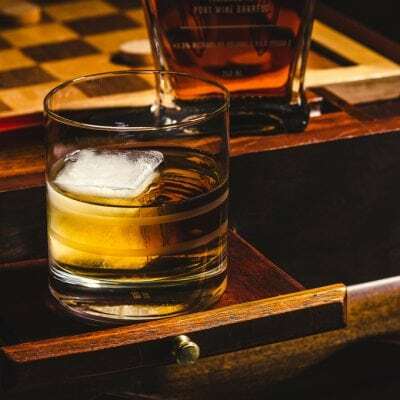 Strain over a large ice cube finish with spritz of Angel’s Envy Rye Finished in Rum Barrels, if you happen to have it. If you want to share a glass of something distinctly delicious with your dad this Father’s day, share the gift of Angel’s Envy Bourbon Finished in Port Wine Barrels or Angel’s Envy Rye Finished in Rum Barrels.